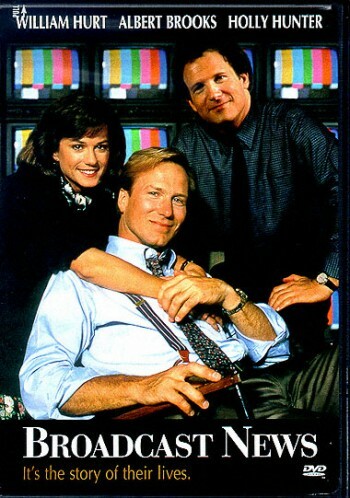 This is a rom-com/inside look into the fast-paced, stressful world of news reporters and producers. It’s smart, funny, and sensitive- a must-see! 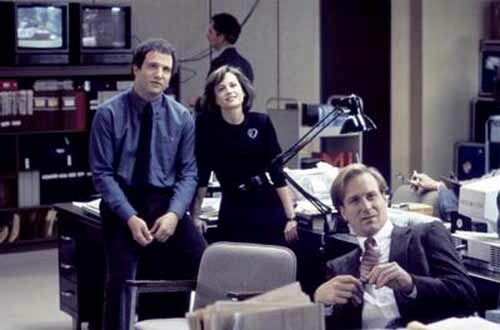 Jane (Holly Hunter) is an energetic and passionate news producer based in DC. Her boss, the news director, sees Jane as a rising star. She is best friends w/ her co-worker, Aaron (Albert Brooks), a man she respects and admires for his talent and integrity. Even though he’s a great writer/ field reporter, Aaron is underappreciated by the higher-ups at the network. He masks his disappointment with humor. At a conference, Jane meets Tom (William Hurt), a handsome anchorman who fears not living up to his position. Tom used to report on sports, but was promoted to anchor before he was ready. Tom looks to Jane for guidance, and she’s attracted to him. However, they have VERY different views about how to report a story! Working closely with Jane, Tom realizes that he has a LOT to learn. Sure, he can present himself well, but that isn’t ALL he needs. He quickly grows to appreciate and respect Jane for her skills. Tom comes up with a GREAT story (on a highly sensitive topic) on his own, impressing the entire newsroom. Aaron is surprised, and perhaps also a little jealous, when praise is heaped upon Tom. When rumors of budget cut-backs and firings hit the newsroom, who will come out on top? Even a revolution can’t keep two people apart, if they are destined to be together! Like I wrote before, there is (usually) NOTHING better than a story about young love, IF it’s done well. You may already be familiar with Dr. Zhivago (from the book and/or classic film); however, this BBC version is quite well done, too. Casting unknown actors is the right decision when remaking a classic; there is no baggage to get in the way. Did you know Keira Knightley was only 17 y.o. when this was shot? This is an impressive effort from her! She expresses a LOT with just her eyes- determination, disappointment, resignation. Hans Matheson (Tess of the D’Urbervilles; The Tudors) hits just the right notes as Yuri- an idealistic doctor/poet who yearns to do good. Aside from being a compelling romance, Dr. Zhivago is also about the loss of innocence. The teenage Lara is seduced by the same powerful and wealthy man (played by Sam Neill) who spent time with her mother. When Yuri meets Lara for the first time, she senses that he wants to protect her. But she forlornly tells him “you are too late.” Yet they are somehow bound, then torn apart, by forces beyond their control.